This quick pizza from your own kitchen tastes so good, you might be tempted to quit ordering in pizza. It's the first time I've made pizza from a prepared "store-bought" crust, but both my husband and son-in-law gave it 2-thumbs up. Even better, I liked it ... much more than I really expected to. I'm fairly picky about my pizza (my mom used to make her own, starting with her own yeast-dough crust, and before I married I used to help her, but it was a long process to get to the point where you could eat the cooked pizza) and won't normally eat "just any old pizza", so finding one I really like, that is made with my own ingredients (except the crust of course) and is fresh from the oven that I can prepare and be eating in half an hour ... that's worth doing again. I'd make this way before I'd order a $20 delivery pizza! his thing more so than mine), but this past weekend just by chance, I went with him. Sometimes I'll do that if he's been away, or so busy we spend hardly any time together. At least if I go with him, we can talk in the car, and while wandering through the stores. 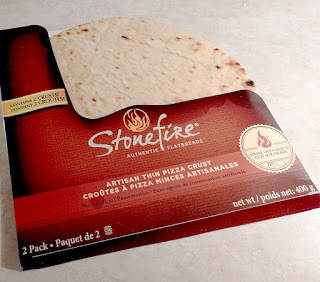 While heading through Food Basics to grab "my" bread, I passed a shelf with StoneFire Flatbreads. I was looking for some soft whole wheat tortillas, but grabbed StoneFire's pizza crust for a change. The one I grabbed had 2 thin crusts in the package (but they also have a regular crust). I'd never seen (or noticed) it before, which I suppose isn't that surprising since I don't always do the grocery shopping. 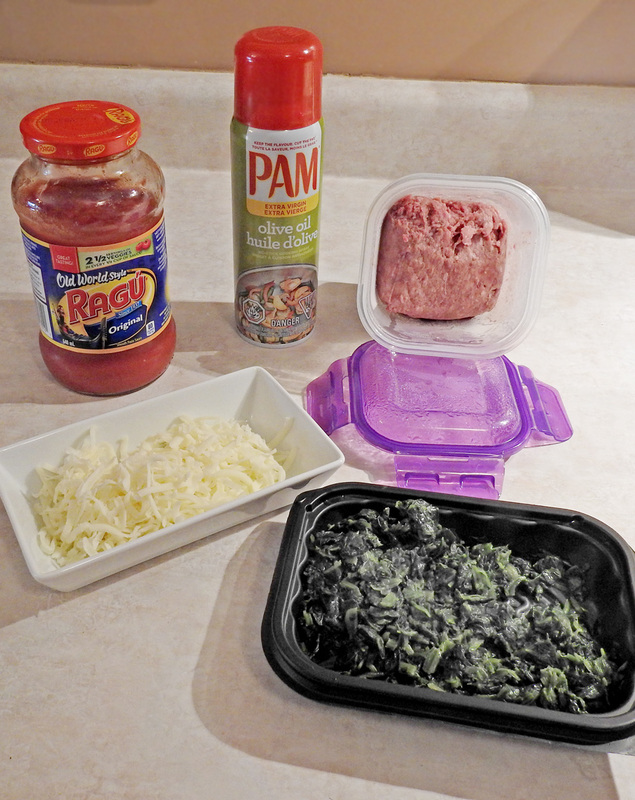 Sunday night I decided to give it a try, although I didn't have some of the ingredients my husband likes (he likes Hawaiian or Pepperoni and Bacon ... me, I pick all that off, but leave the bacon), I decided to use what I had. The main meat (cause the man needs his meat!!!) I used was ground beef, quickly browned. I had mozzarella, and onions (he likes onion in pretty much anything), and bacon ... that would have to do. On my own "half" instead of onion I used spinach. I like onion, but not in everything, and he isn't a fan of spinach in anything. I threw all that together onto the crust (in the proper order of course, because that does actually matter) and slid it into the oven (400°) for 10 minutes. The result was probably one of the yummiest pizzas I've had ... smack-your-lips kind of yummy in fact. The next time (and oh yes, there will be a next time) I'll try cooking it for only 8 minutes. My pizza pan has vent holes in it, which ended up making the crust just a little crispy around the edges. (Oh, that's another thing that surprised me - my hubby ... he never eats the end crusts of pizza. There are always "ridges" of crust left on his plate. This time, nothing left on the plate but a few drips of sauce!) Cooking it for a minute or two less should keep the edges from being "too" crusty. Stonefire Pizza crusts are created in the Italian tradition, made with high-quality ingredients and no artificial preservatives, flavors or colors. Our crusts are baked at a high heat in a stone oven to give it the look and taste of an authentic Italian pizza crust. Stonefire Pizza crusts are ready to be topped and served right out of the package. 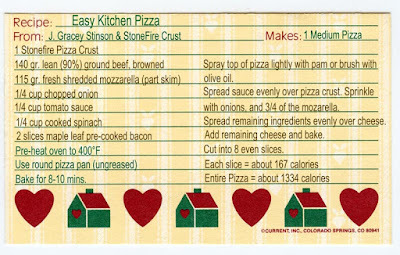 StoneFire Artisan Pizza Crust <--- check them out. ... well, that and the fact that they taste really good too! Naturally, any great crust can be topped with your own choice of ingredients, but StoneFire's website has some interesting and different pizza recipes. The one I used is not theirs, but my own based on what I had on hand. 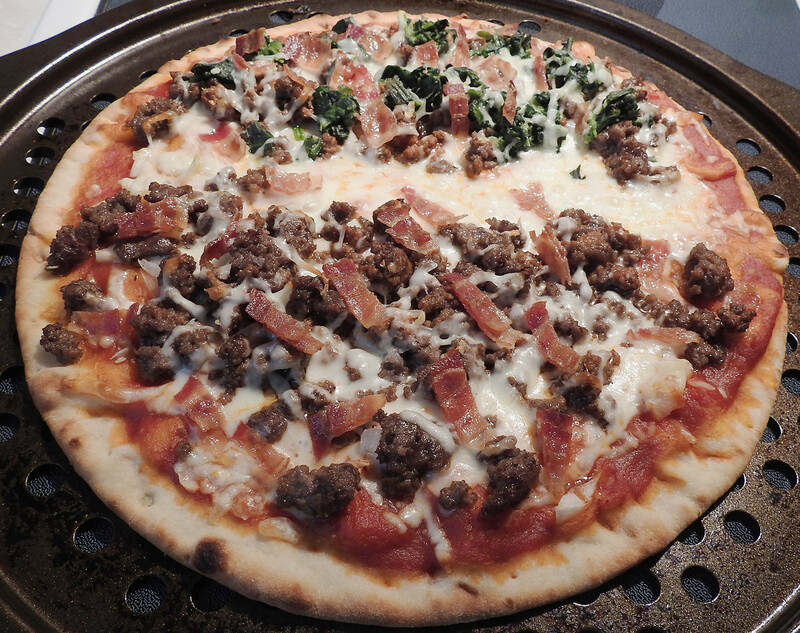 It's really the crust in this case that made it "wizardly" easy to make my own pizza. 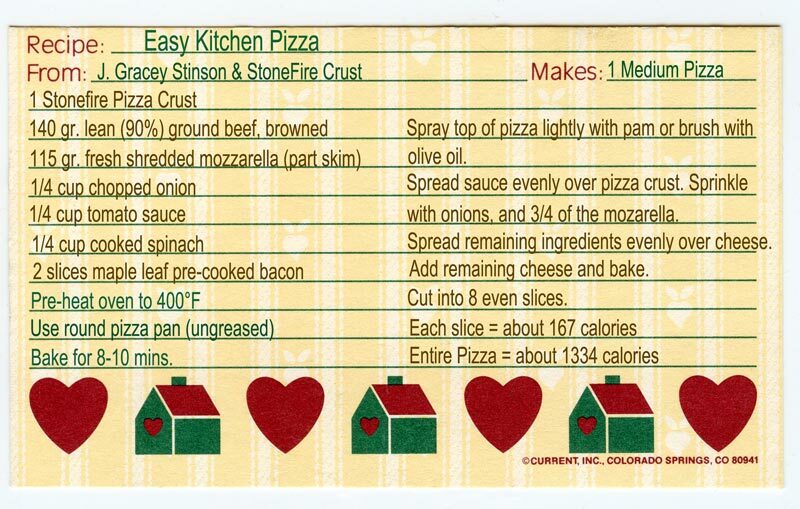 Although this is a recipe (so, going under the cooking menu), it's also a bit of a plug for StoneFire Pizza Crusts (so also under the kitchen product reviews) because they really are worth trying (and make your life easier). Hahahaha! I am laughing here! I see you having fun making your pizza! Me too! I eat only homemade pizza 😊 that is also on my blog. Goodnight Gracey!